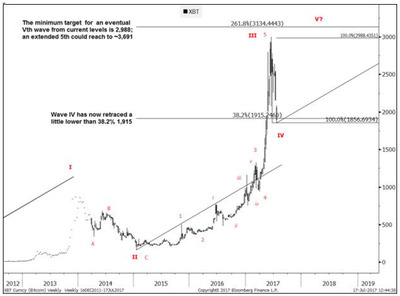 Bitcoin has held strong support and has its sights set on a test of the $US3,000 level, according to Goldman Sachs. Jafari’s latest note comes two weeks after she predicted the cryptocurrency was setting up for a big drop. At the time of her call, bitcoin was trading near $US2,550 a coin. 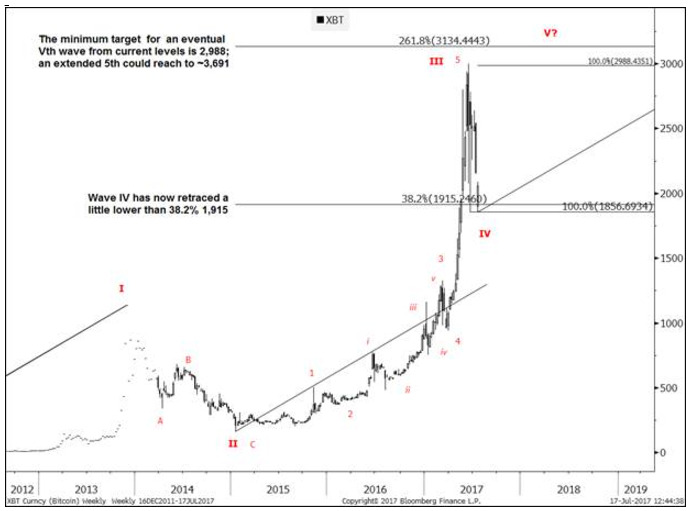 She said that bitcoin was “still in a corrective 4th wave” that “shouldn’t go much further than 1,857.” It fell a bit further, putting in a low somewhere between $US1,758 or $US1,852 (depending on which data you use). Jafari, however, always expected the gains would resume after the correction. Bitcoin is up 140% in 2017. It put in a record high of about $US,3000 on June 12.